In May 1944, the Kagoshima Naval Air Group set up the Kofuji Detachment in Kofuji Village (later merged to form Shima Village and now part of Itoshima City) in Fukuoka Prefecture. In July 1944, responsibility for Kofuji was transferred to become a detachment of the Fukuoka Naval Air Group. In October 1944, Kofuji became an independent naval air group. 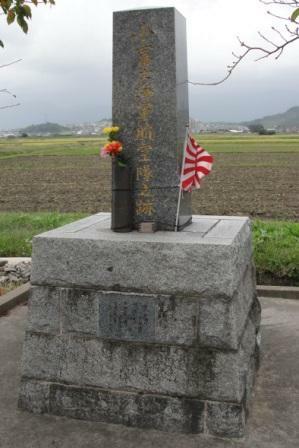 Former members of the Kofuji Naval Air Group erected a monument in 1973 at the site of the former airfield. As the Greater East Asia War situation became critical, the country mobilized youths who burned with desire to protect Japan and were prepared to give their lives for their country. In May 1944, Kofuji Naval Air Group was formed as a training base for young eagles with the objective of supplementing air fighting strength that had been depleted. Training was provided through the end of the war to about 5,000 persons from the 13th Ko Class to the 16th Ko Class of the Yokaren (Preparatory Flight Training Program). Students in their teens in those days enthusiastically joined the Yokaren with heroic determination, willing to give their lives for their country in time of crisis. However, the war situation became increasingly fierce, so Yokaren training was halted , and the young men were sent to various tokko (special attack) bases. Finally with no chance for victory, the war came to an end in August 1945, and the mission of Kofuji Air Group also ended. Considering this air group's history, it did not last even two years, but we acquired the Yokaren spirit by putting our lives on the line and developing rigorous discipline. In the postwar period, this spirit allowed us to endure tumultuous ordeals and become the cornerstone of the development of a new Japan. We erect here the Kofuji Naval Air Group Monument in remembrance of the past Yokaren era. The monument stands in front of Mt. 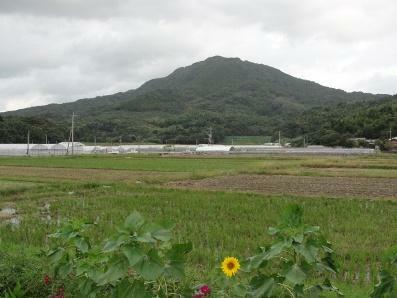 Kaya, also known as Itoshima Fuji for its conical shape similar to that of Mt. Fuji. 1. Yokaren training was suspended on March 1, 1945.